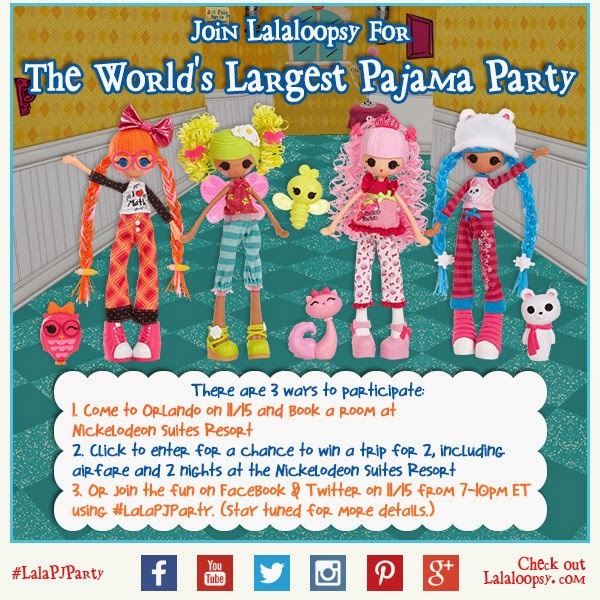 ThemeParkMama: Help Lalaloopsy Break a Guinness Record for Biggest Pajama Party! Help Lalaloopsy Break a Guinness Record for Biggest Pajama Party! Lalaloopsy wants to have the World's Biggest Pajama Party! Lalaloospy is going to attempt to break the official Guinness World Record for most slumber party participants in multiple locations. The current record is 34,000 girls. 1. Join us in person at the Nickelodeon Suites Resort in Orlando on Nov. 15, 2014 from 7-10pm ET for the live party! You can book rooms now at 30% off standard rates by mentioning LalaPJParty when you make the reservation. To book a room, call 877-642-5111. 2. If you can't join us in Orlando, enter for a chance to WIN an all expenses paid trip for two to the event by clicking http://woobox.com/bc35jj to enter. The contest closes on Monday 10/20, so please enter quickly! 3. If you can't attend and didn't win, join Lalaloopsy on Facebook and Twitter on Nov. 15 from 7-10PM ET using #LalaPJParty. Lalaloopsy will posting updates and photos from the event, and doing tons of product giveaways, fun craft activities, and hosting a Lalaloopsy movie viewing party (via Netflix) for those participating online. If you aren't familiar with Lalaloopsy, it is the #1 collector brand for girls ages 2-11. The Lalaloopsy animated series airs on Nick Jr. It will truly be a lot of fun so please join in on November 15, 2014 for a great time!